I recently bought an Alocasia "African mask plant". The woman said it didn't need to be transplanted that the roots weren't too bad. After a couple of weeks it has started to develop just a few small brown spots. I figured it was just adjusting as my house isn't very humid. I have kept him watered and misted. The newest leaf that came up has a tear in it and more brown spots. I feel as though he isn't happy. I transplanted him because when I checked out his roots they seemed quite tight... Here's a picture. What do you think? Avoid directly misting or splashing water onto the leaves. 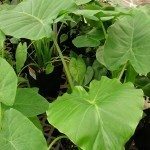 When Alocasia plants are over-watered or when the leaves are consistently wet, they develop a variety of diseases such as crown, stem, and root rot, Leaf Spot, and Xanthamonas. These diseases usually appear as dark brown or black spots on the leaves, surrounded by a yellowish rim. The best way to prevent plant diseases is to avoid over-watering, keep the leaves dry, and provide good air circulation around the plant. 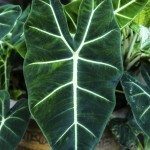 Once an Alocasia plant is infected, quickly remove the damaged leaves and any leaves that have fallen off, isolate the plant from your other plants, and treat with a commercial Fungicide.